The following is an un-edited guest post from my good friend Kristin. I hope you read and enjoy. I can’t wait to make this dish! Greetings! First let me say that Heather is an inspiration (I hope she keeps this in my little guest writing here!) and many times I have curtailed getting fast food or take-out thinking about her blog and lifestyle. She is super busy and if she can find the time in her schedule to eat healthy, then so can I! Save for my mini rice cooker, I do not own any cooking equipment. I borrow my roommate’s and always feel bad about that, so I am always trying to make a meal using just one pan. 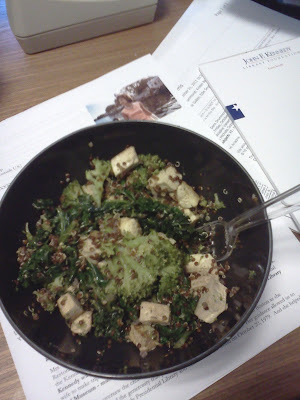 Last night I made a great meal for dinner and the next day’s lunch using: 1 package of cubed firm tofu; kale; broccoli; 1 cup of red quinoa; and some fridge items I had around and wanted to use up (minced garlic, soy sauce, sesame oil and a tiny bit of store-bought peanut sauce). The result was one of the quickest, easiest and tastiest meals I have made. 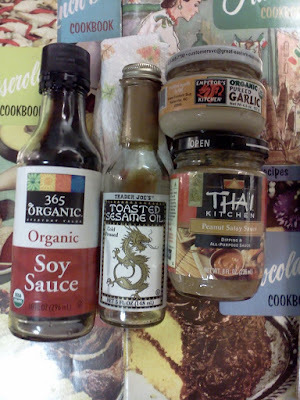 Here are my condiment friends! I used one pan and one rice cooker for this dish. In Pan Land, I eyeballed sesame oil so that it covered my pan and placed the tofu, kale and garlic in said pan – all together. Mixing around with a wooden spoon, I then put in a little more oil and soy sauce – enough so that moving around the kale and tofu gave it a light coating. I then moved the kale on top of the tofu, to let the tofu brown and soak up more of the pan liquids and garlic than the kale. Over in rice cooker Steam Land, I was cooking the quinoa and also steaming the broccoli above the quinoa. The rice cooker is awesome because it tells you when everything is done by giving out a little click so I never have to watch it. Magic! When the broccoli had steamed and the quinoa had cooked I mixed those into the pan as well and then took just 1 spoonful of the peanut sauce and mixed this into the pan, and added a pinch more garlic to my liking. The result was a dish that had people commenting up and down the office when heated up for lunch- “what smells so good?” “oh that looks great!”- and it tasted delicious. I felt very good after eating it too – all healthy-like! And it gave me energy to plow thru a late workday and then run a 5K after work. It’s easy! DO IT! Thanks, Heather!